A group of researchers from Harvard University believes they have found enough evidence to support the idea that there is an ancient Earth existing inside out planet. By ancient, we mean at the time our planet formed, billions of years ago. The team of researchers believes that a previously unexplained isotopic ratio from deep within the planet might be leftover materials from an ancient Earth prior to colliding with a gigantic celestial body that eventually lead to the creation of Earth’s moon. Harvard scientists believe that this could be the remnants of an ancient Earth that existed 4.5 billion years ago, before the collision mentioned above. The creation of Earth’s Moon and its origin are among some of the greatest scientific mysteries of science. While we are still unsure as to how the moon formed, there are several scientific theories which attempt to explain the formation of Earth’s ‘natural’ satellite. According to this theory, the heat generated by the cosmic collision melted the planet causing debris to fly off, eventually creating the moon we see today. However, according to Harvard scientists led by ProfessorSujoy Mukhopadhyay, there is enough evidence to suggest only part of the Earth melted and that an ancient part still exists within Earths mantle. In other words, this means that parts of the ancient Earth, before the formation of the moon still exist below our feet, untouched for billions of years. “The energy released by the impact between the Earth and Theia would have been huge, certainly enough to melt the whole planet. However, we believe that the impact energy was not evenly distributed throughout the ancient Earth. This means that a significant part of the impacted hemisphere would probably have been completely vaporized, but the opposite hemisphere would have been partly shielded, and would not have undergone complete melting.” –Professor Mukhopadhyay. In order to come to this conclusion, the team of scientists analyzed the ratios of noble gas isotopes located deep within our planet’s mantle, and compared the results to isotope ratios located much closer to the surface. Their study showed that 3He to 22Ne ratio from the shallow mantle was much higher than the equivalent portion located deep within our planet’s mantle. This discovery led scientists to believe they came across two entirely different materials: Those belonging to an ancient Earth and those belonging to the new Earth. “This implies that the last giant impact did not completely mix the mantle, and there was not a whole mantle magma ocean,” said Professor Mukhopadhyay. More indications supporting their theory come from the analysis of the 129-Xenon to 120-Xenon ratio. Thanks to material which was brought to the surface from deep within our planet’s mantle demonstrated to have a much lower ratio than the average found near the surface. Since 129-xenon is produced by the radioactive decay of 129-lodine, the isotopes showed that the formation age of this ancient part of Earth’s mantle belongs to the first 100 million years of our planet’s history. “The geochemistry indicates that there are differences between the noble gas isotope ratios in different parts of the Earth, and these need to be explained. The idea that a very disruptive collision of the Earth with another planet-sized body, the biggest event in Earth’s geological history, did not completely melt and homogenize the Earth challenges some of our notions on planet formation and the energetics of giant impacts. If the theory is proven correct, then we may be seeing echoes of the ancient Earth, from a time before the collision,” said Professor Mukhopadhyay. “This exciting result is adding to the observational evidence that important aspects of Earth’s composition were established during the violent birth of the planet and is providing a new look at the physical processes by which this can occur,” said Professor Richard Carlson of the Carnegie Institution Department of Terrestrial Magnetism. NASA CAUGHT HIDING SOMETHING AT NORTH POLE! 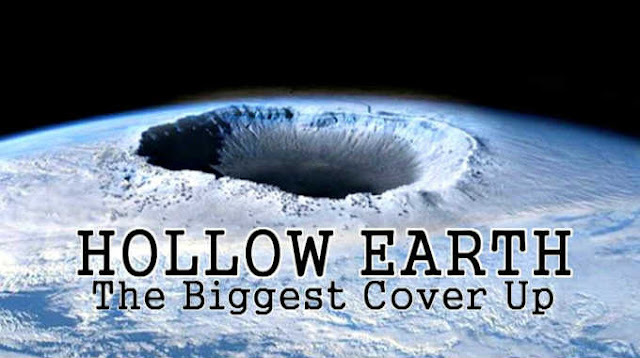 HOLLOW EARTH? This post was republished from ancient-code.com. You can find the original post here.